Do you get heel/ foot pain with your first few steps of the day? Why do I keep pulling my HAMSTRING! Does your shoulder hurt when you surf? Knee Pain IS NOT a Normal Part of the Ageing Process – Don’t Put Up With It! Are you doing it right? Trying to find your Pelvic Floor but still not sure where it is? Is the pain coming from your Back or …………. your Pelvis?? Do you drive a desk all day? 5 Steps From Back Pain! Get Your Core Strength Rocking! Ankle Sprains – why they should be treated immediately! Shin splints – don’t put up with them! Does the thought of a long barefoot walk on the beach make you cringe in pain? Back to School – Does the shoe fit? Did you know that when you reach your 60’s, you naturally lose strength in your muscles, flexibility in your joints and balance in your whole body! It’s very important to stay strong, flexible and balanced as you get older- it keeps you moving and doing what you love! Luckily for you, there is lots you can do to maintain all these qualities in your body and even improve them! You might be wondering why preventing falls as you get older is so important………. Falls are the number 1 cause of hospital admissions and can cause serious morbidity and even mortality in the ageing population. The good news is……… falls are preventable! There is a large amount of research to support the benefits of training strength and balance in rehabilitating injuries, preventing future injuries, and avoiding falls. What types of training activities does the research support? 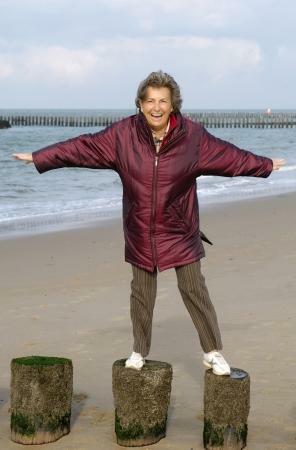 Current evidence suggests that practising balance on stable and unstable surfaces, stepping around obstacles, reaching out of your base of support and global strengthening home exercise programs have great effects for falls prevention. Our experienced Physiotherapists are here to create the perfect individualised program for you to help you get started on your journey to better health! To improve your balance, you need to challenge it with various exercises. If it’s too easy- it won’t help you! That’s why you need a well- prescribed exercise program created by a Physiotherapist to help you achieve your specific goals. If this blog has got you interested and you want to know more, have a look at our ‘Strength and Balance class’ page or download our free Strength & Balance checklist. Copyright © 2017 Aushealth Physiotherapy.